Madonna has collaborated with international shoe retailer Aldo to create a new shoe collection for her Truth or Dare lifestyle brand. 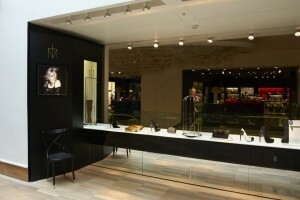 To mark the launch, Pentagram partner Daniel Weil has created a promotional window and pop-up shop in Selfridges London. Truth or Dare is a brand of ‘great personality and affordable luxury’ and so Weil took the opportunity to connect the design to Madonna’s persona as a popular performer as well as to the persona of her brand. 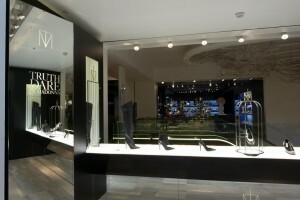 His vision was to create a space that would be both a stage and a shop. Light plays a major role in the pop-up shop: backlit writing on mirrors and carefully directed light beams make the shoes appear to be sitting on a stage of light.